Get ready to discover cosmic gems in every color of the rainbow! 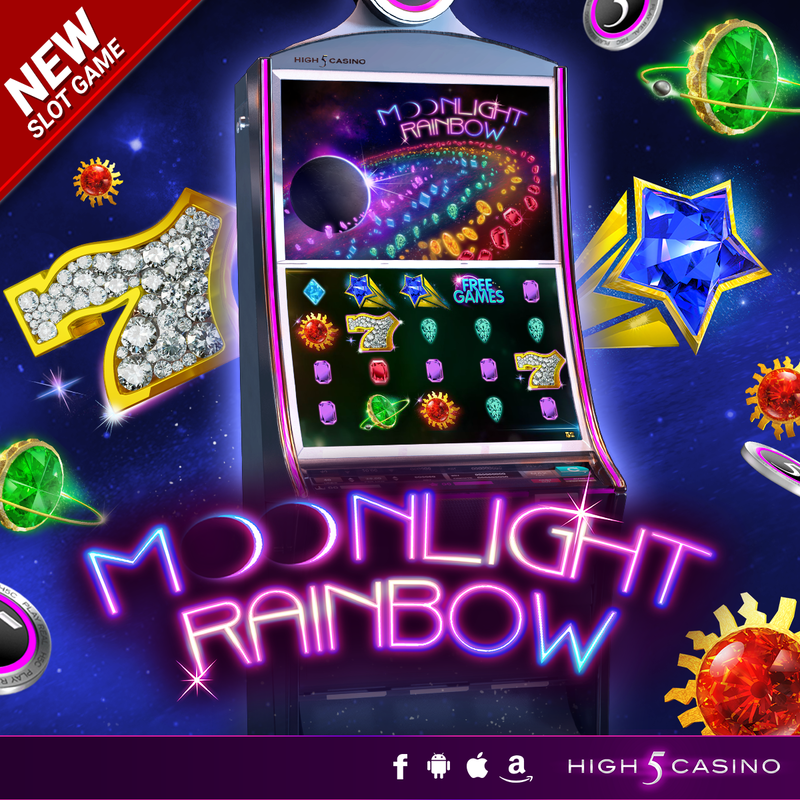 High 5 Casino’s 205th game Moonlight Rainbow arrives soon! Do you ever daydream about sparkling diamonds? Live out your dream in this entrancing slot game featuring cosmic eye candy! A rare celestial phenomenon, this is your doorway to the dazzling dimension of your dreams. Illuminated by special moonlight, discover flawless gems in every color of the rainbow. Travel at the speed of light into interstellar wins in Moonlight Rainbow! Moonlight Rainbow, all that glitters are diamonds! 4 by 5 reels. 50 paylines. Special Features: Tumble Triggers. Check the YouTube video below and get ready to travel at the speed of light on your High 5 Casino Reels! Are you ready to be dazzled by interstellar wins? Comment in the conversation bubble located on the top right corner of your screen and let us know! This entry was posted in game preview, Game Release, High 5 Casino, High 5 Games, High 5 Moments and tagged Android, App Store, Apple, Facebook, Free Games, game preview, Game Spotlight, High 5 Casino, High 5 Casino Mobile, High 5 Games, iOS, iPad, iPads, iPhone, iPhones, mobile gaming, slots, social gaming by hoothigh5. Bookmark the permalink. Is the deal of buying 10.00 in chips will open this game .Is this offer still available ? Hello, Moonlight Rainbow will have quest rewards if a qualifying purchase of $10 or more was made between June 19th 2pm EDT and June 21st 3:00PM EDT. If no purchase was made Moonlight Rainbow will not have Quest Rewards if you unlock it through an Unlock Any Game Reward. If a Qualifying purchase was made, please contact the Support Team via the High 5 Help Center.